← Thursday 11th June 2015 – I found some Leeks!! Friday 12th June 2015 – The greenhouse frame is up!! My sister is very kindly giving me her 8 foot by 6 foot greenhouse as she doesn’t need it in her garden anymore. Her garden is a little on the small side and the greenhouse just takes up too much room. I was the first person she asked if I wanted it, and of course it’s not something that I would turn down. It’s going down on the allotment so it’ll mean that I can grow some of my delicate fruit and vegetables (like Melons, Cucamelons and Tomatoes) in there as well as some in the greenhouse at home. I had cleared the area where it was going the day before, so I spent the morning putting down weed suppressant and then putting a load of wood chips on top of that. Hopefully that’ll keep the weeds at bay. My sister works in the morning, so I then drove to hers around lunch time and after a cup of tea and a bit of a chat we loaded the glass in her car and the frame in my car. It just fitted diagonally through the boot but only just!! I’ve got an estate car, but an 8 foot metal base only just fits in. Then it was off to the allotment to put it all together. Now they had forecast rain and thunder that day, but fortunately we didn’t see any thunder and only had some drizzly rain. We spent about 3 hours putting the frame together and it’s really heavy and sturdy so there is no need to attach it to a concrete base. In fact there are 4 large spikes in the four corners and they are firmly in the ground. We’ll get together next week and put the door on and then the glass in. It’s looking good if a little draughty at the moment. And here stands my greenhouse frame. Soon it’ll be full with all sorts of plants. This entry was posted in Uncategorized and tagged claire's allotment, cucamelons, greenhouse, Melon, tomatoes. Bookmark the permalink. 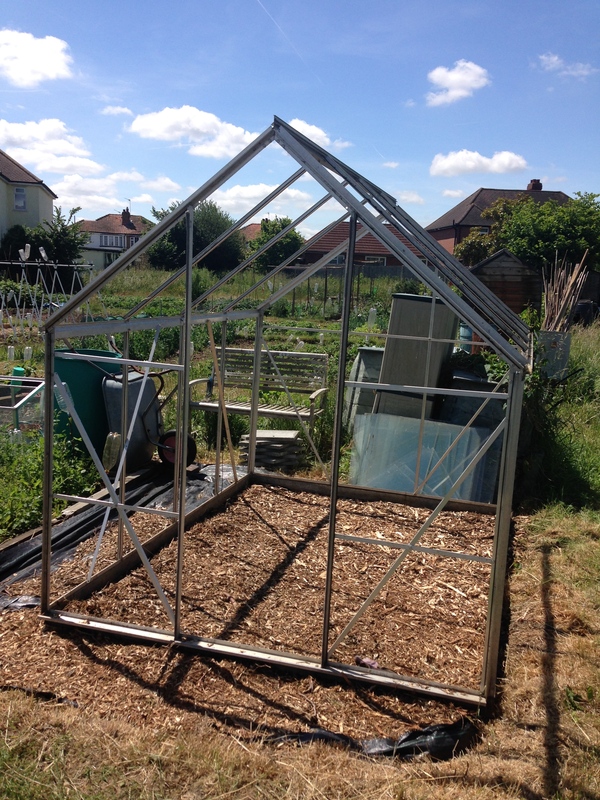 2 Responses to Friday 12th June 2015 – The greenhouse frame is up!! The best things come in small packages!! Hope you get your greenhouse up soon.